Psalms 23:5(KJV); …Thou anointest my head with oil; my cup runneth over. It is one thing to be full of the Spirit of God but it is another to be in the overflow of the Spirit. God has called us not only to be full but to live in the overflow. He is the God that anoints you not only to fullness but so your cup runs over. When you are merely full, you may move in the sufficiency that applies to you as an individual; you increase in wealth; you live in divine health; your marriage and family are a success. However, when your cup runs over, you cannot help but be a blessing to others. In fact, such a one does not need to do much to bless. They can bless by the simplest words on their lips. The simple details of their lives will bless others. This overflow is likened to the flow of the anointing from the head of the high priest Aaron, dripping down upon his beard and running all the way down to the hem of his priestly robes, (Psalms 133:2), that eventually everybody under the man’s mantle gets an impartation regardless of whether that man chooses to bless them or he does not. God wants you to walk in this overflow but how much you are filled is a question of how you choose to yield to His Spirit and how humble you choose to be for Him to fill you. The tenet of this humility is when a man knows that it doesn’t matter how much he has experienced the anointing, there is still more. Beloved child of God, God wants to prove to you that even when you have drunk from Him, He still has more to give. Allow Him to soak you in the overflow of His Person and His Spirit. 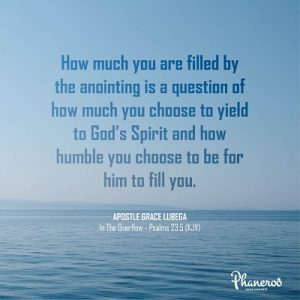 How much you are filled by the anointing is a question of how much you choose to yield to God’s Spirit and how humble you choose to be for Him to fill you. PRAYER: Dear God, I thank You because out of Your fullness [the superabundance of Your grace and truth] I have received grace upon grace, spiritual blessing upon spiritual blessing, favour upon favour, increase upon increase, success upon success and peace upon peace. My cup runs over that I have no choice but to bless all those in my circumference of influence to the glory of Your name. Amen.